Polycon’s new range of road barriers is strong , sturdy and flexible, ideal for today’s roads. 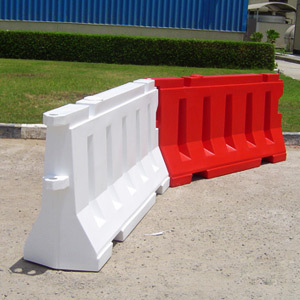 Polycon road/track barriers are made from high quality UV-Stabilized polyethylene material. It’s very safe in case of accidents for the vehicle and its passengers. Being light weight, handling is easier and saves on loading/unloading charges. Weight can be controlled by filling water or sand and is Maintenance-Free. 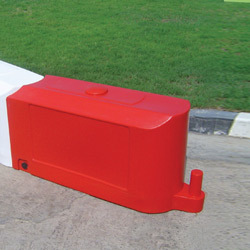 Polycon road barriers are available in black, red and yellow. Our unique track barrier system is better looking than the tires or wooden fencing alternatives, and conveys a safe, professional system. Whatever your track formation, our track barrier system remains interlocked without any gaps, protrusions or obstacles, providing a solid all in one track wall for maximum safety. Whether it is an outdoor or indoor track for karts or quad bikes, this is proven to be the safest and most effective track barrier system. Manufactured at our plant in Mussafah, Abu Dhabi, the track barriers are made to the highest quality of virgin UV Stabilized material. Can be produced in any colour subject to quantity.